Home > Tom Clancy's Ghost Recon: Wildlands > Why aren't we more critical of nationalism in video games? Why aren't we more critical of nationalism in video games? Two years ago when I was in Japan, I went to a gallery that was holding a special exhibition to commemorate 60 years from the day that Japan surrendered in World War 2. 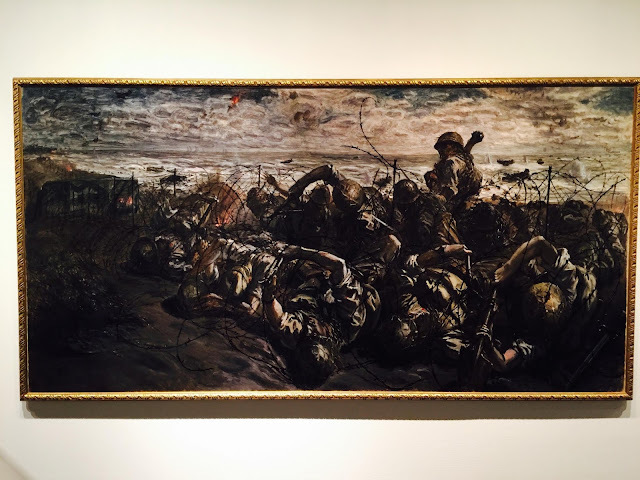 I vividly remember this gallery because the exhibition was focused exclusively on the incredible paintings that the Japanese artists would create of the war; showing the desperate struggle and heroism of the soldiers. Some of these paintings were floor-to-ceiling and would occupy an entire wall of the gallery. They were mesmerising in their epic scale and detail, and pulled no punches in depicting the horrors of war, through which the heroes would rise up and continue to struggle on. These paintings were, of course, propaganda. If not directly commissioned by the government of the time, they were created by nationalist artists that had their own reasons for attempting to build pride in the country through the war: to encourage the people to continue struggling through the hard times out of a sense of patriotism and duty. 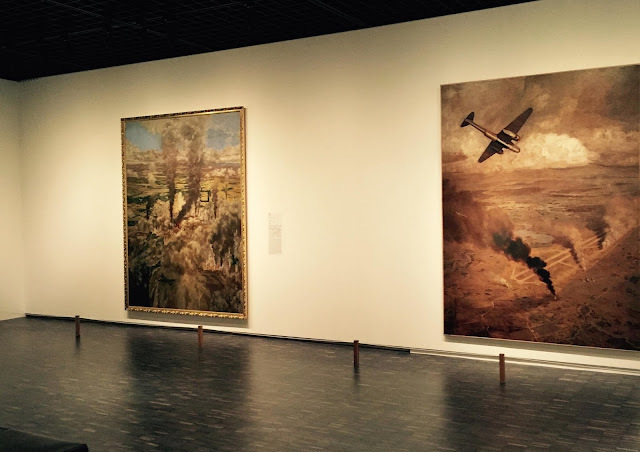 These paintings weren’t explicitly termed “propaganda” then, of course; the Japanese people of the time certainly wouldn’t have thought of the emotional and cognitive manipulation that was going on when they viewed these art works. The Japanese media of the time heralded the greatness of these artists. And, of course, we all know that the Japanese were the enemy through this particular war. We people of the West completely reject the ideology that these paintings represent, which meant that, for me, walking through the exhibition was a sobering experience, and in many ways an eye-opening one. Looking out at the popular art of today that the West produces, particularly in the games industry, it worries me deeply that so much of what is being created is thematically so similar to what I saw in those propaganda paintings. More concerning, is the fact that so few participants in this industry even question these issues. There are really good things going on in the industry; discussions around diversity and women have led drives to improve female participation in games - both as developers and consumers - and there is plenty of media (rightfully) on board with that. There’s also the rightful understanding of the urgent need to improve representation in games for people of alternative sexualities, people of minority ethnicities, and so on. Yet so many of these progressive voices are silent when people start talking about the nationalism and Western exceptionalism that is so prominent in many games. A game like Battlefield 1 is comprehensively praised for its “gritty” depiction of war, as though that somehow made it a champion of progress in the development of shooters. Very few people in the community stopped to question whether it was appropriate for the game to portray the Arabs as willingly subservient fodder for the English empire (and then fail to show us just how badly they were treated after the war, kickstarting so much of the endless conflict that plagues the Middle East to this day). Very few critics noted that in the base game you were only playing as what would become the “Western” powers; the allies that have since become antagonists (such as Russia) were held back as DLC, and the other side isn’t presented in any context other than a largely nameless enemy to shoot. No, Battlefield 1 was not a game that should have been lauded. It was a game that explicitly fed and encouraged nationalist attitudes towards a war that was far more nuanced than the government-approved history books are leading today’s youth to believe. Then, just a few weeks ago, Ghost Recon Wildlands was released; a game that actively celebrated America’s “right” to go into any country and “sort it out” if that country wasn’t playing ball with American interests. It was as explicitly a piece of propaganda as games come, and indeed was the kind of justification for America’s real-world actions in place like Syria that the politicians simply die for. Wildlands was a sales pitch to the younger generations that it’s perfectly okay to blow up a country as long as it serves “Western” interests. 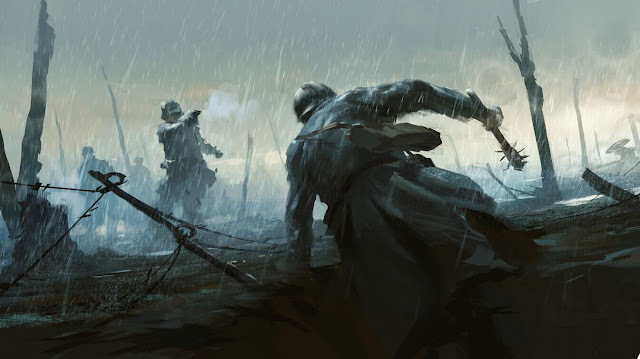 Concept art from Battlefield 1. Note the thematic similarities with the propaganda painting above. I could go on; Homefront games are utterly toxic in their nationalism. Call of Duty games, before becoming so utterly ridiculous in their science fiction trappings, had more than a few “Saving Private Ryan” moments of their own. But even looking at science fiction, a game like Destiny - which was all about holding back the unwashed masses to protect the last bastion of humanity = was a fundamentally nationalist concept which we also see play out in the real world: the less educated of “Western” countries really do think that any place outside of their borders is untamed, uncivilized, and not free. Almost any story that reflects a “pocket of light against an endless darkness” is going to be a metaphor for nationalism. Much of this also applies in films and television, too. But speaking specifically about games, where critics are more than capable of jumping in and providing sharp criticism for examples that they consider to fail from a gender or diversity point of view, the actual criticism of games that reflect nationalist ideology is limited, at best. Trawl through the bulk of the reviews for Wildlands and it might get a mention or two in some of the more negative reviews, but in most cases it was a non-factor in the game’s all important final score. I’m pretty sure I’m the only one that even bothered to highlight the nationalism in Battlefield 1 or Destiny (apologies if I missed it, anyone). I don’t think that’s deliberate. You only need to look at the response that nationalist movements are getting in the mainstream media to realise that there is a large - and vocal - community of people that don’t approve of these ideologies. The problem is that it’s so ingrained into our ideas of entertainment and culture that, overwhelmingly, we’ve been desensitised to the point that we don’t really notice it any longer (even when we oppose it). I don’t even think it’s deliberate on the part of the developers. I don’t think the teams behind Battlefield 1 or Wildlands intended for their games to promote these attitudes. It’s simply that these kinds of stories have been gone unquestioned for so long that no one really thinks about the cultural and social attitudes that they express when writing the stories. They’re simply the kind of safe, tried-and-true stories that sell copies of games. That is the whole point of propaganda, anyway. It’s meant to be subtle and it’s meant to develop attitudes in a culture that no one really questions. I must admit that despite my lifelong belief in relativism the extent and depth of nationalism in games didn’t really click with me until I had the opportunity to study how opponents of “the West” would themselves portray war and the outside world. Only then was I able to see how much of a mirror to it so much of the media that we consume is. Most game critics haven’t had the opportunity to properly study the way that art was used as a propaganda tool in the Soviet Union, China, North Korea, or Japan of World War 2. Therefore, most people haven’t been made aware of just how frequent and extensive it is in the games industry. While this is all understandable, it is also concerning because nationalism leads nowhere good, actively encourages racism, and xenophobia. 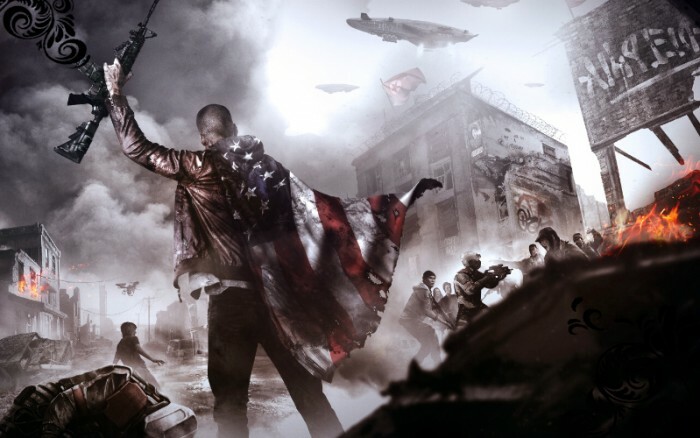 Just to make it more explicit, here's the key art from Homefront 2. The nationalism drips from it. I encourage everyone, if they get a chance, to go and have a look at the Japanese paintings of World War 2. Indeed, have a proper look at the propaganda that was produced for all of the enemies of “the West” over the years. I can guarantee that you’ll laugh or dismiss almost all of it. Now, consider how games like Battlefield 1 and Ghost Recon Wildlands might look to others outside of “Western” culture. I would suggest that we, as a collective, need to be far more aware and sensitive examples of games that act as propaganda for those nationalist attitudes if we have any interest in seeing a more tolerant and fair society.